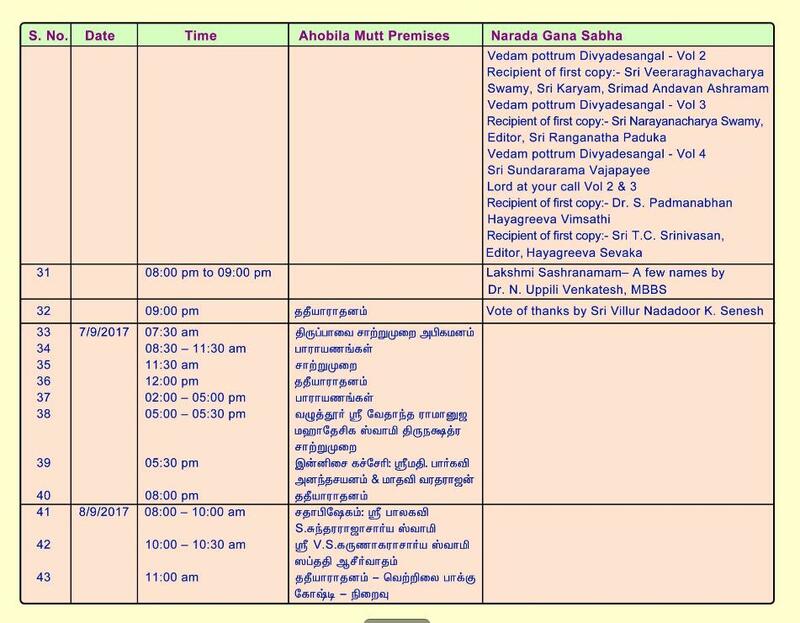 Sri Villur Nadadoor Shastra-sahiti-vallabha Karunakaran Swami’s 71th Thirunakshatram is on 8th September 2017. 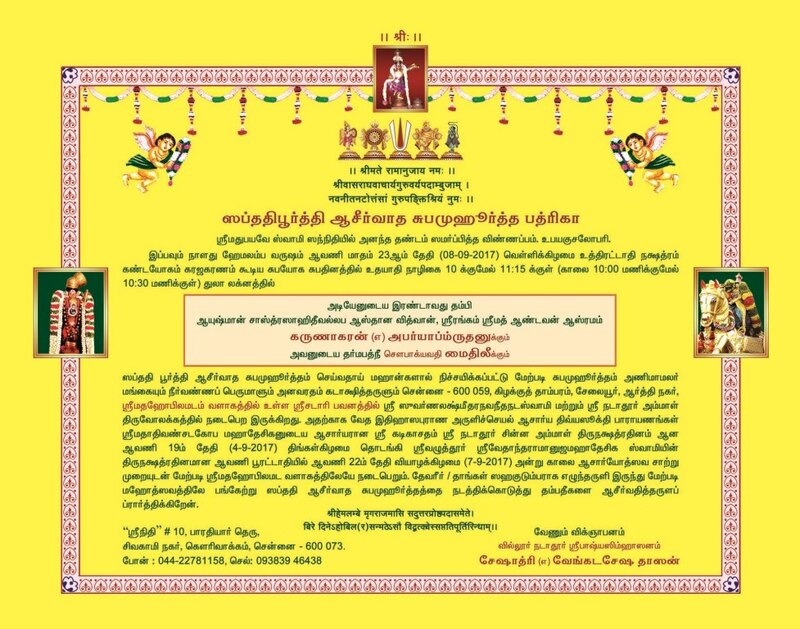 The traditional Saptati celebrations, as announced before, will be held in “Sri Satari Bhavanam” (Ahobila Mutt complex, Selaiyur), 8, Arthi Nagar, East Tambaram, Chennai 600059 on 7th and 8th of September 2017. The location can be seen in Google maps https://tinyurl.com/y7bmq5rt . 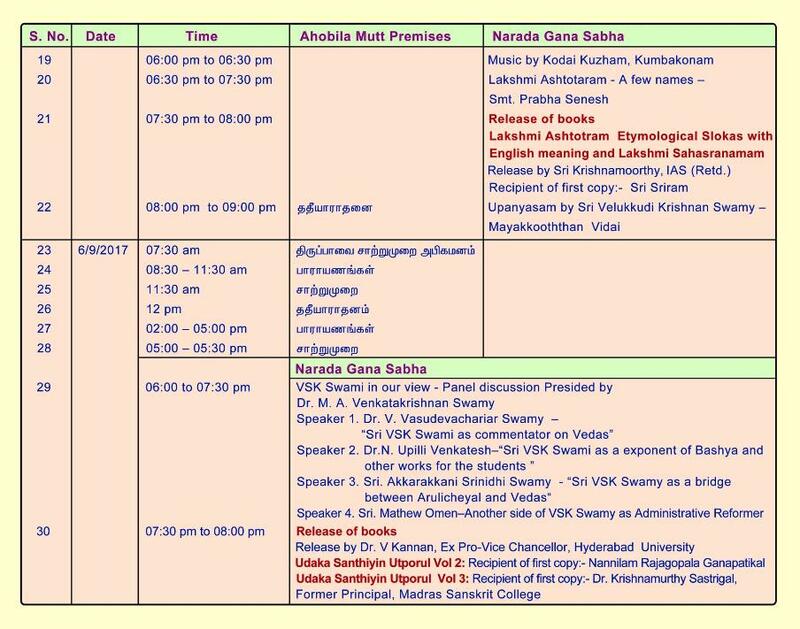 Preceding this will be paarayanam of Vedas, Divya Prabhandam, Srimad Bhagavatham, Srimad Ramayanam etc. on 4th, 5th and 6th of September in another location within the same premises. 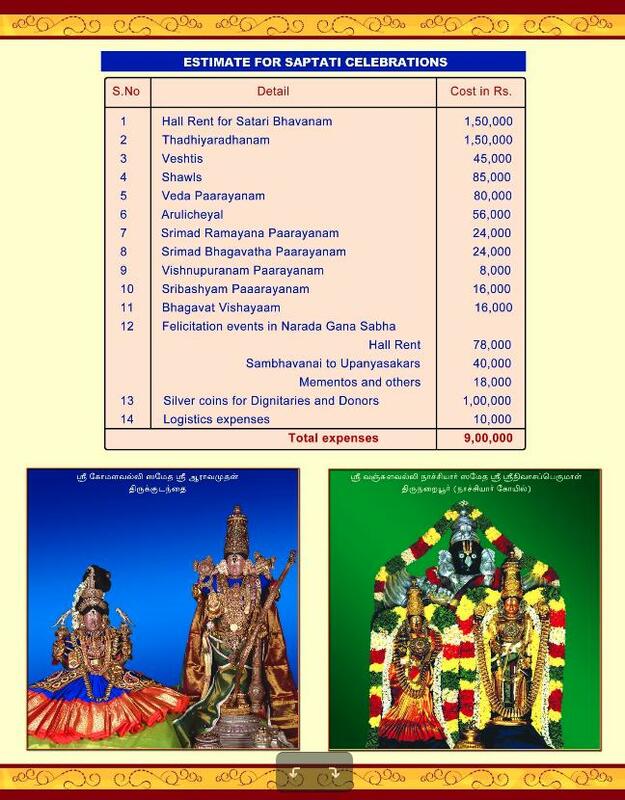 There will be a Thadiyaradhanam on all days and all Bhagavathas are requested to kindly participate. Our Swami has been rendering upanyasams for the past five decades and has enthralled live audiences all over India. It is a credit to his extreme erudition that he could connect with the audience from a wide spectrum of listeners. 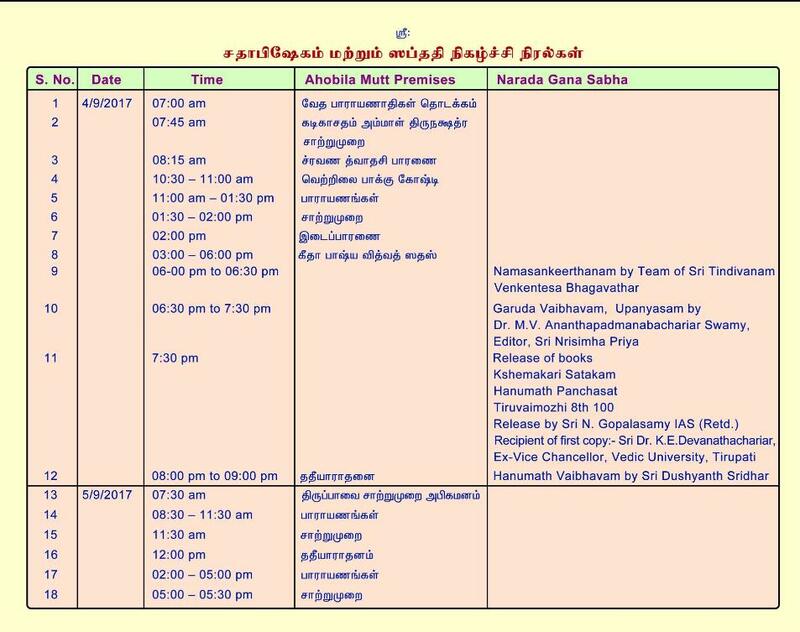 In the evenings on 4th, 5th and 6th of September 2017 we have planned a series of programmes including Bhakti recital, upanyasams by prominent and upcoming scholars and felicitation of our swami in Narada Gana Sabha. Swami has authored various path-breaking literary works of which Udakashanthiyin utporul and Vedam Pottrum Divya Desangal are very highly acclaimed works. Some portions of these works have been published and the balance is planned for release now. These treasure-troves help to interpret some of the esoteric meanings of the Vedas and the pleasurable way of understanding them. Contemporary Vedic scholars have hailed this exemplary work by our Acharya as no scholar has ever attempted such a task. His Upanyasams on Goddess Mahalakshmi – Lakshmi Sahasranamam and Lakshmi Ashtotram – have been serialised in Vijay TV and feature his Nirukthi Shlokas for each of the Thirunamams. It is highly unimaginable that one can compose more than 1000 captivating Shlokas in these modern times. It is to express our gratitude and devotion to this great scholar that we have worked to bring out his various new literary works during his Saptati celebrations. Most of the books are in advance stages of proof reading. These publications which run into thousands of pages of content are invaluable treasures for the present as well as for posterity. They are a rich content for research scholars and enrich the understanding our glorious Vedic heritage. 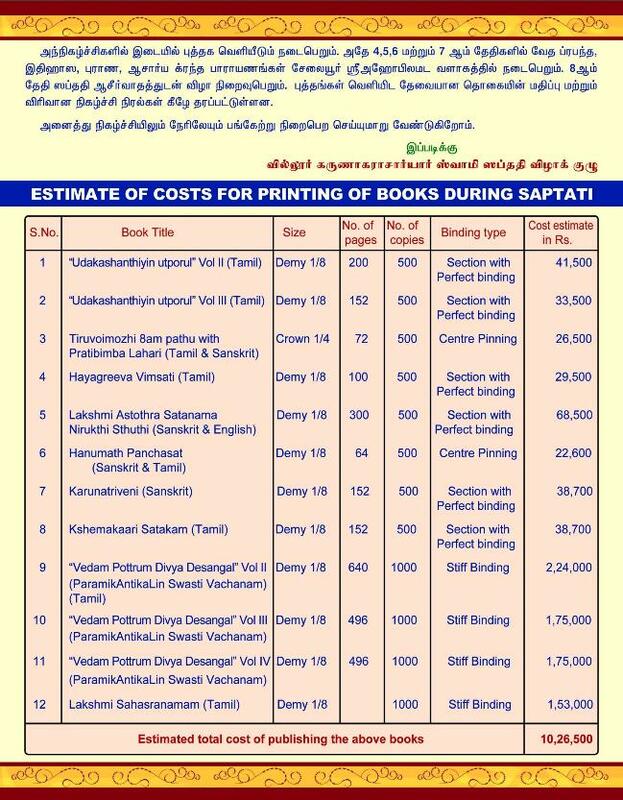 These publications need generous funds as despite the digital age, many scholars and readers prefer to read the printed book and also to easily refer to them. Hence, we request all Bhagavathas to contribute generously to help in our endeavor. To facilitate creation of a corpus and sustain these activities , we have opened a bank account , details of which are as below. 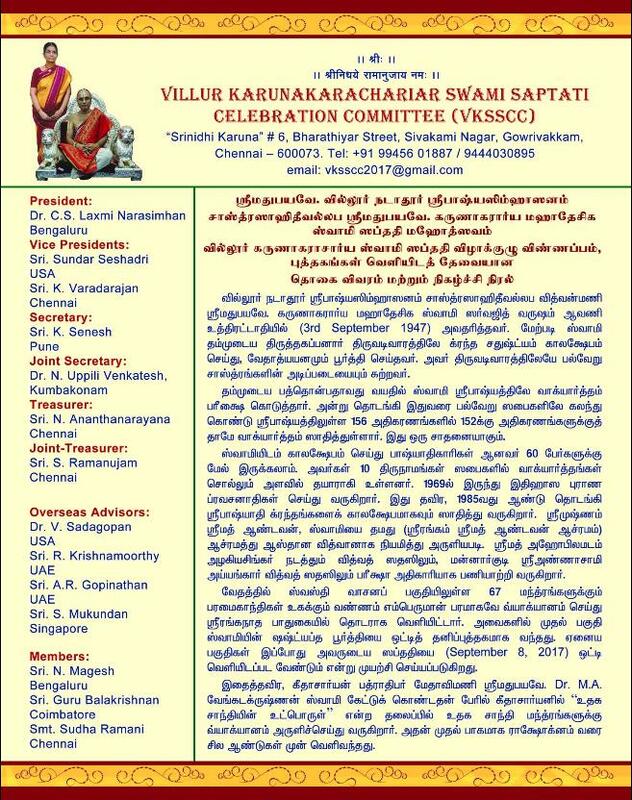 Cheques / DD can be drawn on Villur Karunakarachariar Swami Saptati Celebrations Committee or VKSSCC and sent to our address above. Remittances can also be sent by PAYPAL to villur_karunakaran@yahoo.com . Kindly send details of remittances to vksscc2017@gmail.com for acknowledgement and accounting. 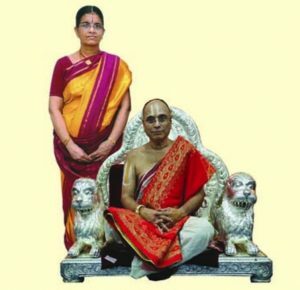 Sri V.S Karunakaran, popularly known as U.Ve Karunakarachariar Swamy is a scholar well-versed in Sanskrit, Tamil, English and also the literature in these languages. This makes him a rare personality. That, he completed his Vedic learning, earned an Engineering Degree and served the Government of India as a very high ranking official all the while living a traditional way of life makes him a much rarer personality. Shri VS Karunakaran did his Vedic learning under his father and at the same time completed his schooling and BE in Mechanical Mngineering in Madurai. As a result, he completed Samhita Moolam at the age of 21. Because of his strong vocabulary and knowledge of literature – having parallely learnt the Shastras- , he was able to continue his Vedic studies in padapaatam even while working. He constantly practised the reciting of the Vedas, saying at least one prashnam everyday, even when working in a private firm. He wrote the exam for Engineering Service India and was posted in Hyderabad, in Calcutta and then in Chennai. In steps, he completed the Sakha paatam also by 1979. Having been born in the glorious lineage of Sri Nadadoor Azhwan, a nephew of the Great Vishistadvaita Acharya Sri Bhagavad Ramanuna, Sri VS Karunakaran had also to adhere to the various Shastraic practices ordained in their traditional family. Sporting a tuft, preparing and eating food as per traditional norms was a challenge in his illustrious Professional career but he managed them with ingenuity. Another hall mark of his revered way of life is that he has been rendering discourses on various aspects of the Ramayana, Mahabharatha, The Vedas etc. His discourses are extremely popular and have shaped many a young Indian. He has rendered discourses in Tamil, English and Sanskrit all of which have been possible due to the tutelage under his illustrious father and the consequent mastery over literature. He is equally adept in Dwaita, Advaita and Vishistaadvaita philosophies which gives him a very broad canvas of different schools of thought. Sri Karunakaran has been an acclaimed poet and has composed numerous poems and Stotras in both Sanskrit and Tamil. Some of the Stotras composed by him are used as daily prayers in temples too. He has been a prolific writer even from a very young age and his writings have been celebrated by various leading scholars as being novel and path-breaking without diluting the traditional and true essence of our Vedas and Shastras. He has been a regular contributor to various religious magazines like Sri Nrisimhapriya, Sri Ranganatha Paduka, Geethacharyan to name a few. He has a strong belief in Vedas and the Vedic way of life and strives to live in accordance to the extent possible, He firmly believes that the chanting gives inner strength and spiritual power. “This cannot be proved, but it is something one feels internally,” he says. So inspired is he with the impact of Vedic learning that he has written meanings for parts of the Vedic chants in Tamil. “Most of the chants are used for sacrifices. But there are prayer portions which are beautiful poems like the outpourings of Azhwars as well,” he points out. He has written several books, connecting it with the Vaishnavite philosophy of Azhwars and Acharyas -Vishishtadvaitam. The first volume of Svasti Vachanas came out in 1997, and since then has been renamed as Vedam Potrum Divya Desangal. His commentaries on further portions of Swastivacana are being published in Sri Ranganatha Paduka serially. 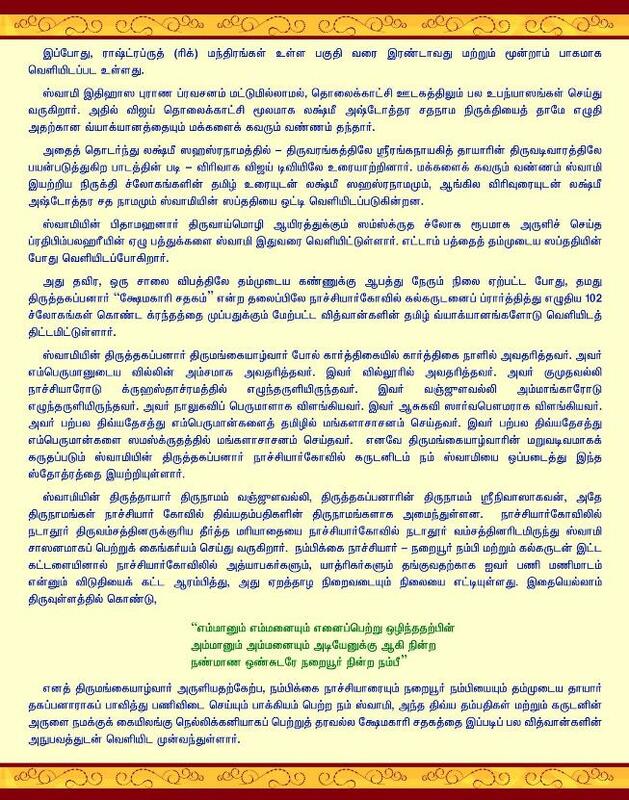 His commentary on Udakasanthi is published in Geethacharyan magazine. His book “The Lord at your call” elucidating the “Namas” of Vishnu Sahasaranama with a short anecdote in English has been very popular with all age groups. It has been translated into Telugu and Hindi and has been equally popular in these languages. Sri Karunakaran is a leading Scholar and Teacher of Sri Bashyam which is a commentary on the Brahmasutras by Sri Bhagavad Ramanuna. He has been teaching various students in the prescribed method of KaalakshEpam. These KaalakshEpams are so popular that many of his students who have moved to other cities and countries have been learning now on Skype to continue their learnings. His son and nephew are also his students. Since his retirement as Industrial Advisor to the Government of India, he has devoted his time to writing books, rendering Upanyasams and conducting Vidwat Sadas. His Upanyasams are extremely popular and appealing to all age-groups as they are very current dated and impart values. He is adept in using technology and his Upanyasams and Vidwat Sadas feature multi-media presentations which make it easy for the audience to follow the discourses. The Vidwat Sadas conducted by him are also very interesting for various upcoming scholars as apart from sustaining the interest in the Sanskrit Language, they provide a platform for the upcoming scholars to test their mettle. His approach to the Vidwat Sadas as in the case of his literary works, has been novel. In recognition of his exemplary and scholarly contributions, he has been honoured with various titles which include Pravachana Bhushanam, Desika Darshana Chudamani, Shastra Sahiti-Vallabha, Pravachana Vachaspathi etc. He is also the Asthana Vidwan of Srimad Andavan Ashramam.